Tourism Australia has launched a $5 million, socially-led campaign that uses a dedicated news channel curated by youth to win over the youth travel and working holiday market. Aussie News Today kicked off its first broadcast from the Sydney Harbour Bridge today featuring former Wallabies rugby union star, Nick Cummins, with Home and Away actor, Lincolm Lewis, and TV presenter, Teigan Nash. The intention is to share stories from across Australia by broadcasting them directly into the social news feeds of younger people and potential travellers globally. Four target markets are in the spotlight first: The UK, France, Germany and Italy. Tourism Australia is launching dedicated Aussie News Today Facebook and Instagram profiles as well as a news hub on Australia.com. There’s also a dedicated hashtag: #aussienewstoday. 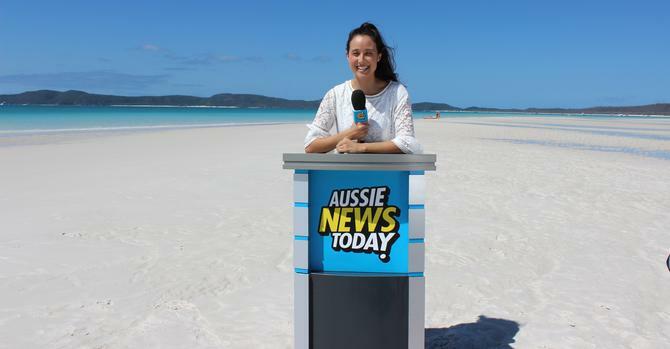 Eight previous winners of a Tourism Australia competition this year will also travel around the country in campervans to collect stories for the news channel. Tourism Australia managing director, John O’Sullivan, said the new campaign would highlight unique destinations and experiences of particular appeal to younger travellers from across Australia. These range from crocodile cage dives and selfies with quokkas, to camel racing and tuna throwing competitions. “We plan to put a smile on young people’s faces with Aussie News Today, by serving up fun, sometimes irreverent and uplifting news stories of daily life Down Under,” he said. According to Tourism Australia, youth travellers represent one quarter of all international visitor arrivals to Australia and 46 per cent of visitor spend at $18.7 billion. Australian Minister for Trade, Tourism and Investment, the Hon. Steven Ciobo MP, said travellers under 30 were a critically important part of the visitor mix. The $5m campaign is the third in a series of youth and working holiday maker (WHM) campaigns founded through an additional $10 million provided to Tourism Australia as part of the Government’s WHM reform package, and comes at a time when Australia’s working and temporary workers visas are under scrutiny.